The UK has named two Russian nationals suspected of the attempted murder of former Russian double agent Sergei Skripal and his daughter Yulia. Prime Minister Theresa May said the suspects entered the UK on Russian passports using the names Alexander Petrov and Ruslan Boshirov. Moscow denies any involvement in the attack. In an interview with Russia's state-run international broadcaster, RT, on 13 September, the two men said they were in the UK to visit the "wonderful town" of Salisbury and see its "famous" cathedral. Investigative website Bellingcat has since claimed Mr Boshirov is actually an intelligence officer by the name of Colonel Anatoliy Chepiga. Mr Skripal and his daughter were discovered unconscious on a bench in the Wiltshire city of Salisbury on 4 March. A second poisoning incident in nearby Amesbury in July is believed to be linked to the attack. The British government says a military-grade Novichok nerve agent was used. Here's what we know so far about the movements of the Skripals and the Russian suspects on 2, 3 and 4 March. 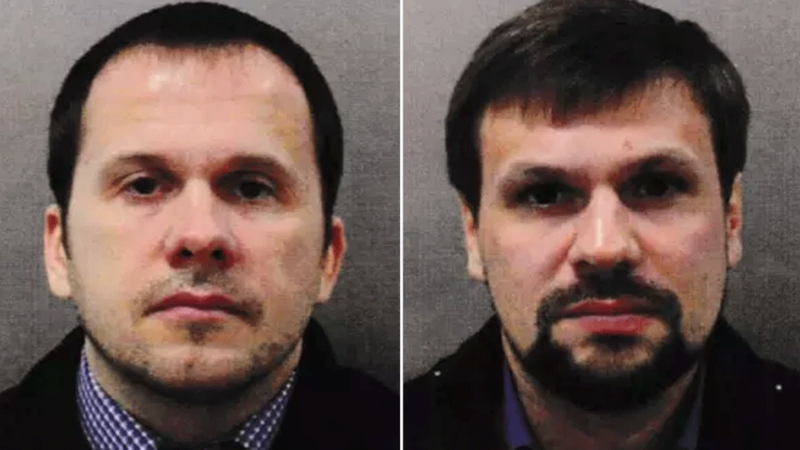 Two suspects using the names Alexander Petrov and Ruslan Boshirov arrive at London Gatwick Airport from Moscow on Aeroflot flight SU2588. Police say the men are thought to be officers from Russia's military intelligence service. The men say they work in the sports nutrition business and were in the UK on holiday. Russian officials have denied claims by the Bellingcat website that Mr Boshirov is Col Chepiga - who is reported to have been working undercover for the past nine years after serving with a special forces unit under the command of the GRU - Russia's military intelligence service. They travel to London's Victoria station before heading to Waterloo for about 18:00 GMT. They then make their way to the City Stay Hotel in Bow, east London, for the first of their two-night stay. 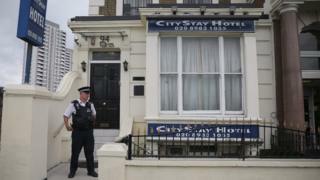 Traces of Novichok, below the levels that would cause health concerns, were later found in their room. 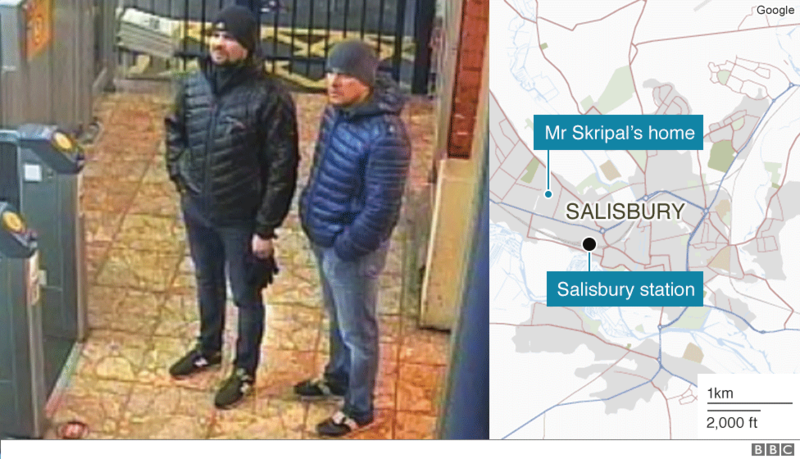 The Russian suspects arrive in Salisbury from Waterloo on what police believe was a reconnaissance mission. 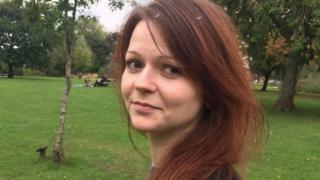 Sergei Skripal's 33-year-old daughter, Yulia, flies into London's Heathrow Airport on a flight from Russia. It is believed she was picked up by a family friend. 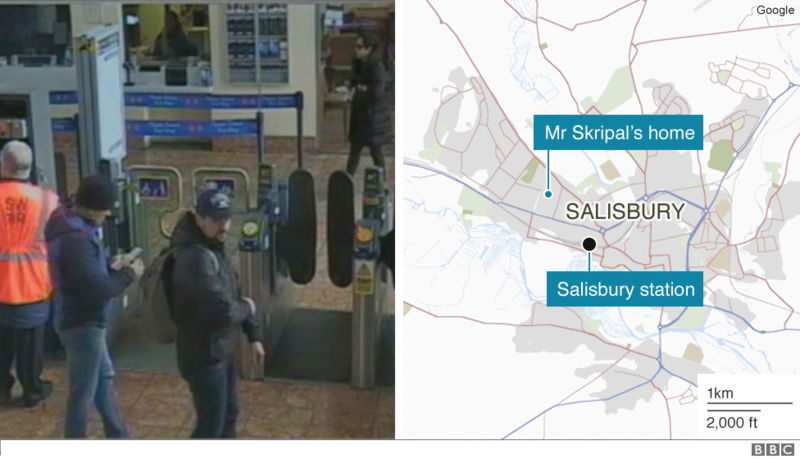 The Russian suspects return from Salisbury to London by train. The Russian suspects again take the London Underground from Bow to Waterloo, before continuing their journey by train to Salisbury. 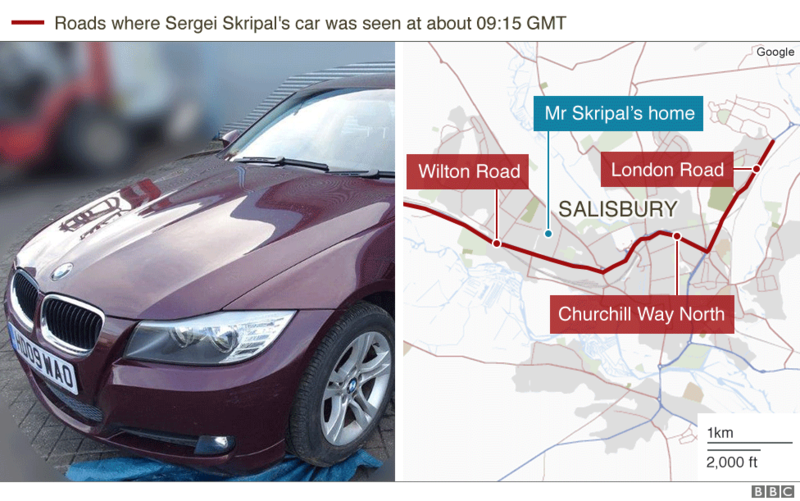 Mr Skripal's red BMW is seen in Salisbury in the area of London Road, Churchill Way North and Wilton Road. 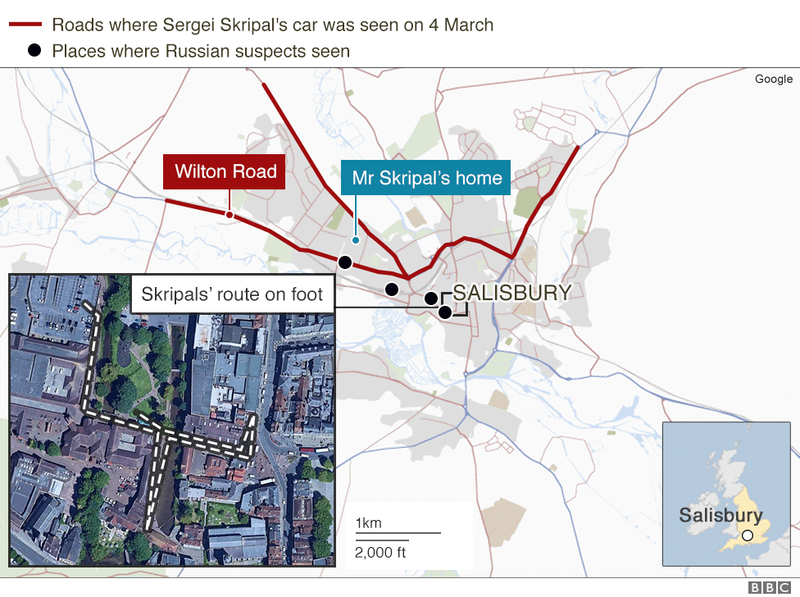 London Road is home to Salisbury's cemetery, where Mr Skripal's wife Liudmila and son Alexander are buried. The suspects arrive at Salisbury station. 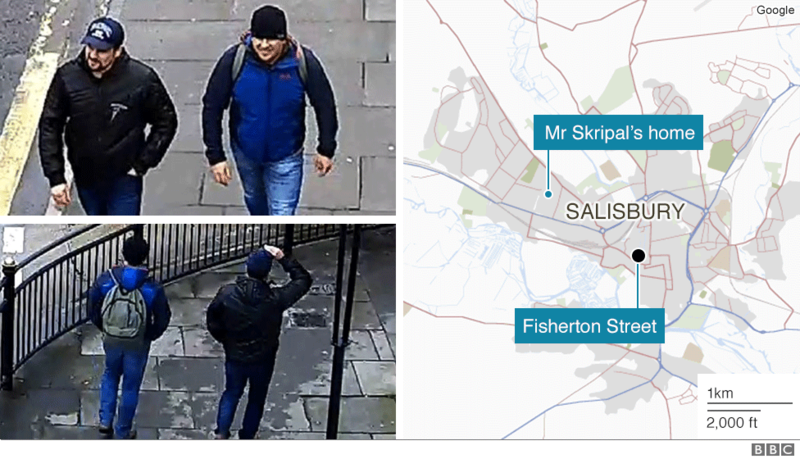 They are about a mile from Mr Skripal's home. The men are filmed on CCTV at a Shell petrol station on Wilton Road, not far from Christie Miller Road, where Mr Skripal lives. Police believe this was moments before the Novichok was sprayed on the door handle of Mr Skripal's house. The Russians are seen on CCTV on Fisherton Street, possibly on their way to the train station. 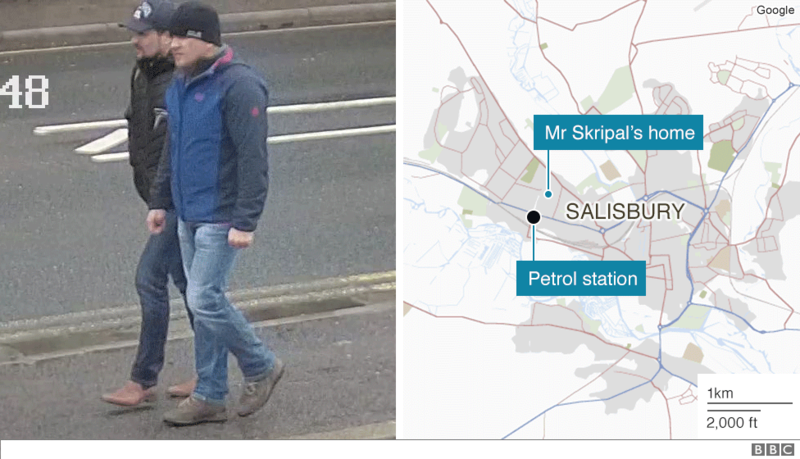 They pass close to where the Skripals would later spend the afternoon having a drink and a meal together in the centre of Salisbury. 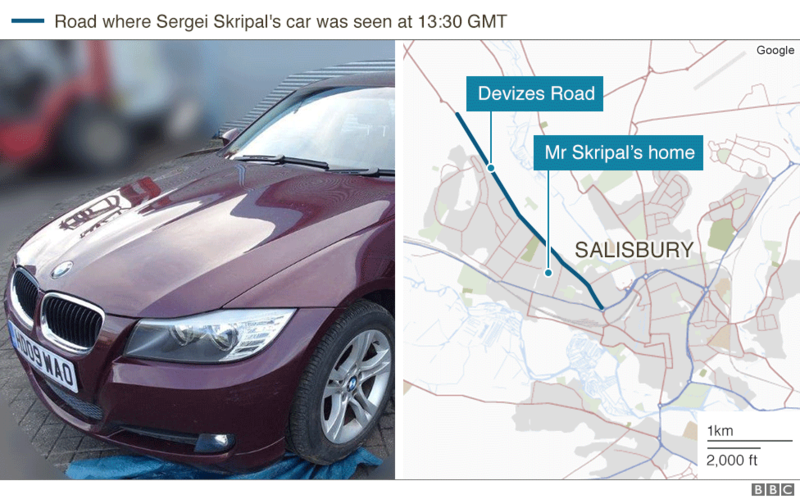 Mr Skripal's car is seen driving down Devizes Road, towards the town centre. 1) Mr Skripal, 66, and his daughter arrive at the Sainsbury's upper level car park at the Maltings shopping precinct. 2) They then head to the Mill pub. 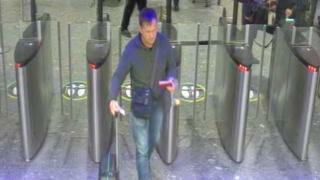 The two Russian suspects return to London by train, arriving in the capital at approximately 16:45 GMT. 3) The Skripals dine at Zizzi restaurant and stay until 15:35 GMT. Traces of a military-grade nerve agent are later found at the Mill and Zizzi. 4) Emergency services receive the first report of an incident. Police find the Skripals on a bench in an "extremely serious condition". They are taken to hospital along with police officer Det Sgt Nick Bailey, attending the incident. All three were later discharged. The suspects board the London Underground to London Heathrow Airport. The men are caught on CCTV going through passport control at Heathrow. The pair depart on Aeroflot flight SU2585 to Moscow. Police note: all times approximate. A massive clean-up operation was launched to decontaminate nine sites known, or thought, to be contaminated with the nerve agent. UK authorities said the highest concentration of Novichok was found at Mr Skripal's house, but the operation involving more than 200 personnel, included eight other sites. Wiltshire and Novichok again hit the headlines in July, when another couple fell ill in suspicious circumstances, in Amesbury, only a few miles from the Skripal investigation. Paramedics are called twice to a flat in Muggleton Road, Amesbury, after Dawn Sturgess, 44, collapses. A friend of the couple, Sam Hobson, said Ms Sturgess appeared to have had a fit and was "foaming at the mouth". Paramedics return to same address after Ms Sturgess's friend Charlie Rowley also falls ill.
Police initially think the two had been using heroin or crack cocaine from a contaminated batch of drugs, however they declare a major incident after Ms Sturgess and Mr Rowley need treatment for suspected exposure "to an unknown substance". Tests at the UK's military research lab, Porton Down, find the pair had been exposed to the nerve agent Novichok. Five areas the victims are believed to have visited prior to falling ill are cordoned off: in Amesbury they are Muggleton Road, Boots pharmacy and the Baptist church, while in Salisbury and John Baker House in Rolleston Street and Queen Elizabeth Gardens. Ms Sturgess dies in hospital on 8 July. Mr Rowley remains in a critical condition. Police later confirm the Novichok that poisoned Ms Sturgess and Mr Rowley came from a small bottle found during searches of Charlie Rowley's house on Muggleton Road. The counterfeit Nina Ricci perfume bottle, with a specially-adapted applicator, had been picked up by Mr Rowley from a charity bin on 27 June. He told police he got some of the contents on himself while he was putting the bottle parts together. Ms Sturgess applied some of the substance to her wrist before feeling unwell. The working assumption of police is that the bottle was a container discarded after the Skripals' poisoning, according to BBC security correspondent Gordon Corera.